If you are looking for a new counter-depth refrigerator there are many things that you should look at before you go out and buy one. First, you should take measurements of your kitchen to make sure that you buy a fridge that will fit where you want to put it. If you have overhanging cabinets, you will also want to measure the height of the fridge so that you can be sure it isn’t too tall for the space. You will want to make sure that the fridge can fit through your doorway as well. You would be surprised how many times people think that they order the perfect fridge and then they find that they must remove a door, and sometimes even the frame of the doorway, to get appliances inside. If you have a fairly high budget for a fridge, and you want one that is of a high-quality, then this could definitely be a good option for you. With this fridge, you have the option of paying at the checkout to have someone install the fridge for you, or you can just buy it and install it yourself. As far as quality goes, this is definitely a nice refrigerator as it has glass shelves, humidity control and LED lighting, which allows you to see the contents of your fridge with ease. This is a very nice stainless steel design, and as long as you aren’t looking to store a ton of food, the 13.4 cubic foot size of this fridge should be large enough for you. This fridge has a bottom-mount freezer which makes it very easy to be able to reach the contents, and it also has an energy star rating of 461 kWh to reassure you about your electricity costs. The only drawback of this product, according to many people, is its price. 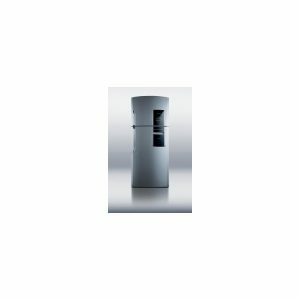 It is slightly more expensive than other refrigerators in the same category. If you are looking one that isn’t too big but has enough space on the inside, then this could be the one for you. If you have the budget for a high-priced fridge and want a dual-door model, you might want to take a look at this fridge. This is a very large fridge capable of fitting a ton of food within its large 23.1 cubic foot capacity. The freezer on this unit is located at the bottom of the unit. This fridge is made with a stainless-steel design and has a water dispenser built into it so that you can get fresh cold water at the touch of a button. Inside, you will notice that it is lit up with bright LED lights allowing you to easily find the food that you are looking for. This fridge has three different settings that you can choose in order to change the interior temperature of the fridge to suit whatever you are storing. One thing that you may not like about this fridge is that there is no additional warranty option on checkout. 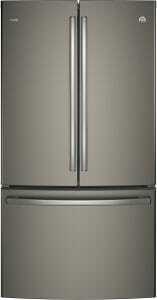 If you’re looking for an advanced refrigerator you are in luck. You will get filtered water in no time, LED lights positioned throughout, and a unique door alarm. This is a fairly expensive fridge, but it definitely has some nice features built into it to justify the higher price. This unit is available with and without installation so that you can install it yourself if you feel capable. The unit is 18.12 cubic foot allowing this fridge to meet the storage needs of most families. This fridge has some premium features built into its design such as a built-in ice maker so that you don’t have to make cube ice in the top freezer of the unit. This fridge is a very nice platinum color that helps the fridge to blend in nicely with a wide range of kitchen designs. One thing to note is that this fridge has a 30-inch counter depth so you should measure before going out and buying this fridge. It may be too big for your needs. It takes up a lot of space. When it comes to convenience, you don’t get any better. 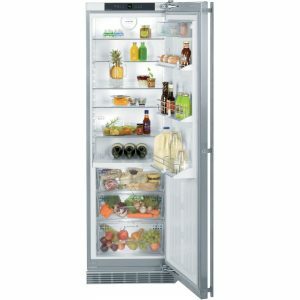 From external temperature controls, vegetable/fruit crisper, and a power cool function, this is a top range Refrigerator. 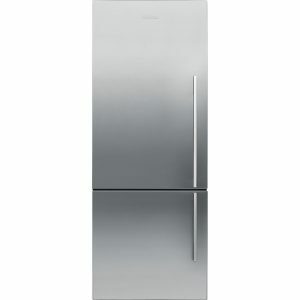 If you want an appliance something that is sleek and stylish then this could be the fridge for you. This isn’t a massive fridge as it has a capacity of 12.5 cubic feet. If you don’t need an overly large fridge, then this does have some nice features which help to make this fridge worth its price. This fridge has premium glass shelving as well as a large variety of interior bins that you can use to store all of your food contents as you need. This fridge has a humidity-controlled crisper to keep your food fresh for a longer period of time, and this unit even has LED lighting which allows you to see the contents inside of your fridge with ease.A wine rack, which isn’t built into a lot of fridges, comes with this model and is a nice bonus to have. This unit has a 24” counter depth which is something that you should remember, and this unit does have a bottom-mount freezer. The only drawback of this refrigerator is that its design might not suit small houses or apartments. A wonderful sleek design, yet quite spacious inside. So, if you are short on space in the kitchen, this will fit in perfectly. If you don’t need a large fridge and don’t have a massive budget to get one, this is an option you can consider. This is an 11.1 cubic foot fridge that has a top freezer incorporated into the design. This unit is made from eye-appealing stainless steel and has simple features that help make up for the price of this fridge. This fridge has four different door bins built into its design in order to offer a lot of storage in the door. Another nice thing that you will notice is that it has three spill-proof shelves. This fridge has a built-in mechanism which assists the fridge in closing on its own, and it is a very quiet operating unit, which is great if you want your appliances to be seen, but not heard. This refrigerator’s hinges cannot be switched. This is the only drawback of this product. This is one the best top of the range refrigerators. 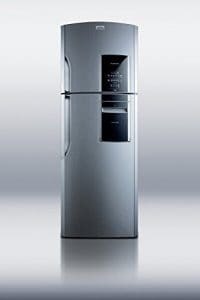 If there is a problem, it will automatically send data to an LG consultant, so when you phone they will be able to read and interpret the error code on their computer– quite a smart refrigerator! 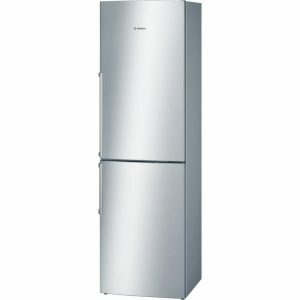 If you have the budget and you want a nice white fridge, you should check out the features on this Bosch model. This fridge has a 24” counter width as well as a 10-cubic-foot capacity. The fridge features glass shelving inside of the unit and LED lighting throughout the fridge. This fridge has hidden hinges built into its design which adds to the eye appeal. Another thing you are going to notice about this fridge is that it has electronic controls which allow you to change the temperature to suit the needs of the products that you are storing. There is also spill-proof shelving located within the unit, so that you don’t have to take everything out of your fridge to clean it when a spill or a mess happens. Door gets stuck for 30 seconds after it is closed. This is a feature to save energy but may cause inconvenience to some users. 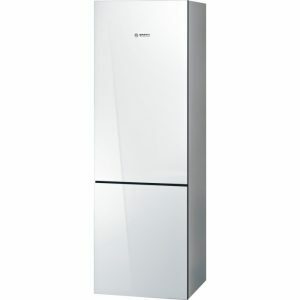 If you’re searching for a refrigerator that is energy efficient, then this is the model for you. It is energy star endorsed, so you can be assured of an energy efficient appliance. If you want one of the most expensive refrigerators on the market, this may be the one for you. This fridge can come uninstalled or you can pay to have someone professionally install the fridge for you. This fridge doesn’t have a massive storage capacity at 11.9 cubic feet, but it definitely has some of the best storage available as far as fridges go. This is a full-size fridge without a freezer portion and you will be able to store a lot of goods within the confines of this fridge as a result. This fridge has a ton of drawers that offer optimal storage conditions for products such as meat, vegetables, and fruits. There is a wine rack incorporated into the design as a nice bonus feature to have, and there is a lot of door storage built into it as well. Hinges cannot be switched properly. There have also been issues with poor customer service. If you have a large family, this is perfect. The Liebherr RB1410 has VarioSpace features, which means shelves can be removed to create more storage space. If you want a fridge for a trailer, or for your room or garage, and just need something small, then this could be a good option for you. The best thing about this fridge is that it doesn’t sacrifice looks even though it is a much smaller size than a regular fridge. Instead, this is an eye-appealing fridge with a stainless-steel front and painted sides on the unit that can be used for a lot of different purposes. This fridge has an energy star rating, and it is 3.1 cubic foot in size, which is large enough to fit a decent amount of food inside. This unit has a built-in freezer on the top of the unit which is not something that you will find every time when you buy a fridge of this size. Additional features include an adjustable thermostat for you to be able to set the optimal temperature for your food; an interior light to help you see; as well as a wide variety of door shelving and interior shelving which can help you organize things to suit your needs. This refrigerator is not suitable for big houses with many family members. If you are a student at a college or you live alone, this is perfect for you. It is compact and doesn’t take up a lot of space. If you are looking for a fridge that is packed with features, then this may be the fridge for you. This fridge is 14.12 cubic feet, which means that it should be large enough to meet your storage needs. This fridge is made with a platinum finish to make it look good regardless of where you place it. This fridge has the freezer located on the top of the unit and is built to provide a frost-free operation so that you don’t have to constantly de-thaw the unit. This unit glass shelves in the interior, all of them are adjustable and removable so that you can customize your fridge to fit the products that you want to fit inside. This fridge does have some very good door storage and you will find that this fridge has both full and half shelves, as well as compartments in the door so that you can have easy access to things like condiments, and butter and cheese. The door shelve is actually large enough to be able to hold a gallon worth of product which is quite a lot as far as door storage goes. One unique feature that you will enjoy about this fridge is that it has an express chill-zone feature that lets you cool down your products quickly in different time increments according to your needs; this feature has an alarm built in as well so that your fridge can let you know when your things are done chilling. This refrigerator does not come with an automatic ice maker. Some users have also complained about poor customer service. If you need things cooled quickly, this refrigerator can handle it. This can cool food in various increments (minutes) and an alarm will sound to let you know when it is cool. Quite impressive! Although this is a high-priced fridge, it does have some very nice features built into the design of the unit which help to make up for the higher price. This unit is quite large with a storage capacity of 17 cubic feet, and it has a wide swinging door on the top, as well as a bottom-mount freezer. This unit has a stainless-steel design on the front of the unit, and it also has a water dispenser, which is a nice bonus. This fridge has some very nice shelving, both in the fridge as well as in the freezer, to help keep you as organized as possible. You can pay an additional fee at checkout to get a 3- or 4-year warranty. This product is pricier than other products in the same category. 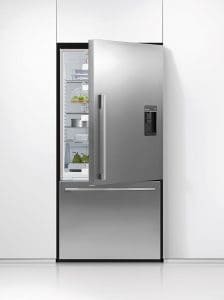 If you are looking for a fridge that is easy to operate with an advanced control panel, then the Fisher Paykel RF170WDRUX4 model is ideal. Access at your fingertips! 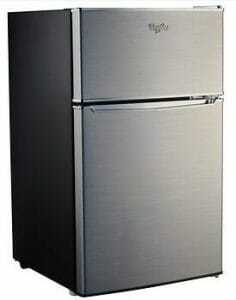 Over the years, refrigerators have increased in size. Now, for food storage, that might seem like a good option, but for space efficiency, it’s not so good. Counter-Depth refrigerators are a slimmer alternative that offers a sleek look. But how do you go about selecting the best one that suits you? There are currently three very diverse types of counter depth refrigerators: regular, professional and integrated. Counter depth (or shallow depth) refrigerators do not obtrude from the cabinet and provide a cleaner, more linear appearance in the kitchen. Professional counter depths are categorized by their restaurant appearance and 84” height with compressors on the top of the unit. An integrated refrigerator fits flush the cabinet and becomes indistinguishable from the cabinet itself. This style needs a minimum of 25” depth. The market is rife with different kinds of refrigerators nowadays. Many leading manufacturers offer various products that come with unique features. There are so many options available in the market that it can be difficult and at the same time, stressful to choose the one product that satisfies all your needs. When you are looking for the best refrigerator for your beautiful house, you need to consider some aspects before you decide on one product and make your purchase. Some of these factors are their efficiency, their size, their electricity consumption and of course, their prize. We have created this listing after doing a meticulous research in order to help you in your hunt for the one refrigerator that meets all your needs. All these products that are mentioned above will definitely grab your attention when you do your own research. We are sure that you will be compelled to check them out. We cannot stress enough that you should conduct a thorough examination of different refrigerators before you zero in on a product because all the products in the market come with their own sets of pros and cons. In the end, it all comes down to personal preference and which style will better suit your needs and requirements. If you are looking for a counter depth fridge but you don’t want to spend a fortune on it, the Fisher Paykel RF135BDLX4 Counter Depth Refrigerator is a great option. You will definitely get value for your money. Besides being the best budget option, we would have to select the Fisher Paykel RF135BDLX4 model as the overall choice too. It has bright LED’s that light the interior, it is extremely quiet, and it is perfect if you have limited space available. We highly encourage you to take a look at the Bosch B10CB80NVW 24″ 800 Series Energy Star Qualified Counter-Depth Bottom Freezer Refrigerator with 10 cu. 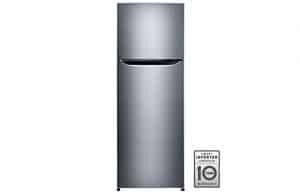 ft. Capacity if you are looking for an incredibly energy-efficient refrigerator. When it comes to the features, this awesome product will exceed your expectations in every regard.